Father William J. Scanlan passed away April 26, at Marian Manor in South Boston. He was 66 years old. 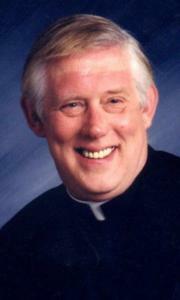 Father Scanlan was born in Dorchester on June 5, 1946, the son of the late William F. and Kathleen V. (Carnes) Scanlan. He was raised in Dedham and graduated from Boston College High School. He attended St. John's Seminary and was ordained to the priesthood by Archbishop Humberto S. Medeiros on May 20, 1972. Father Scanlan's first assignment following ordination was to Our Lady of Mercy Church in Belmont from 1972 to 1975. He was then assigned as associate pastor of St. Timothy's Church in Norwood where he served from 1975 to 1983. From 1983 to 1994 he served in a served in a series of special assignments including specialized ministry to youth at Pilgrim Center in Braintree; assistant chaplain at Long Island Hospital in Quincy; chaplain at Southeast Correctional Center in Bridgewater; and co-founding a transitional program called Home for Now, Inc. During much of that time he was in residence at St. Monica Church in South Boston. On Jan. 28, 1994, Father Scanlan was made pastor of St. James Church in Stoughton, where he served until 1997, when complications from a heart condition made it necessary for him to take health leave. In 1998, after a time of recuperation, he returned to active ministry with the Archdiocese of the Military Services, serving as a Veteran's Administration hospital chaplain assigned to the Palo Alto Heath Care System in Palo Alto, Calif.
After being granted senior priest/ retirement status March 2002 because of physical disabilities, in 2005 he began to assist at St. Brigid's Church in Johnston, R.I.
Father Scanlan is survived by his sisters, Maureen (Ryan) Favorito and her husband Sabino of West Roxbury, Mildred Robison of Weymouth, Margaret Hoeg of Easton, Marie Diauto of Florida; and several nieces and nephews. In addition to his parents, he was predeceased by his step-mother, Mildred Ryan; by his brothers, George and Robert Ryan; and his nephew, Tony Favorito. Calling hours and a funeral Mass were held May 1 at St. Brigid Church in Johnston, R.I. and at St. Timothy Church in Norwood on May 3 followed by interment at Mt. Calvary Cemetery in Roslindale.